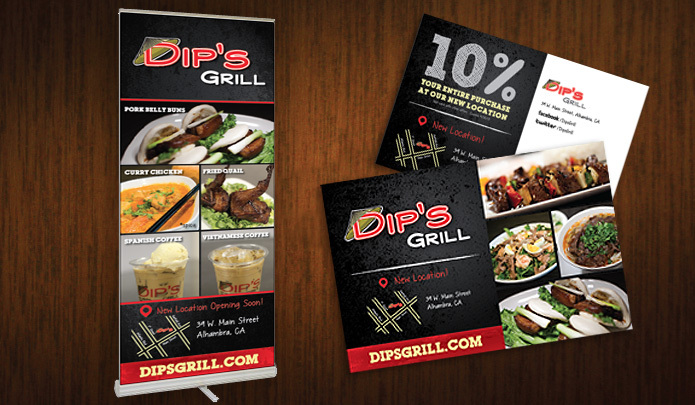 Having relocated from their previous location on Valley Boulevard, Dip’s Grill came to Ready Artwork requesting to have several banners designed to help promote their new location. The client was especially satisfied with the final products and went on to request for additional print items to promote their new lunch specials. One of the main challenges with these projects was making sure the new designs were cohesive with their existing brand along with creating excitement and freshness for their new lunch specials. In order to keep the new designs consistent with Dip’s Grill’s existing promotional prints, Ready Artwork decided to stay with the same color scheme while introducing different typography within the new designs. Along with the “New Location” banners, our graphic designers worked tirelessly to create fresh new prints for promoting the client’s special lunch menu. Our designers made sure to showcase the new menu items with high resolution photos and bright colors on all marketing material.